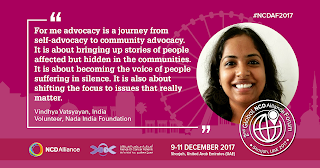 Vindhya Vatsyayan came to the 2nd Global NCD Alliance Forum as a youth delegate, eager to learn how to better represent the voices of those who suffer NCDs in silence. Today she is using the knowledge and inspiration gained there to do just that. Here she shares some of her key reflections. 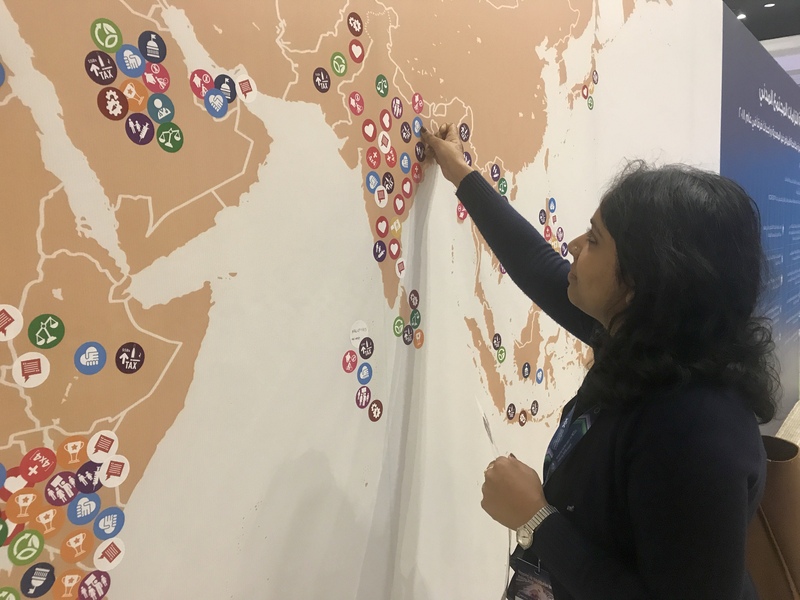 My father always keeps an eye on what is happening around the world and where he can send his daughter to learn new things, and that's exactly how I ended up attending the Youth Pre-Forum Workshop at the 2nd Global NCD Alliance Forum in Sharjah, UAE. I filled in the application form very meticulously; but honestly, it was quite simple because all I had to do was share my story, experiences and the change I want to see in the world. It was not just focused on my qualifications, but more on why I feel so strongly for a cause and how I plan to bring change. 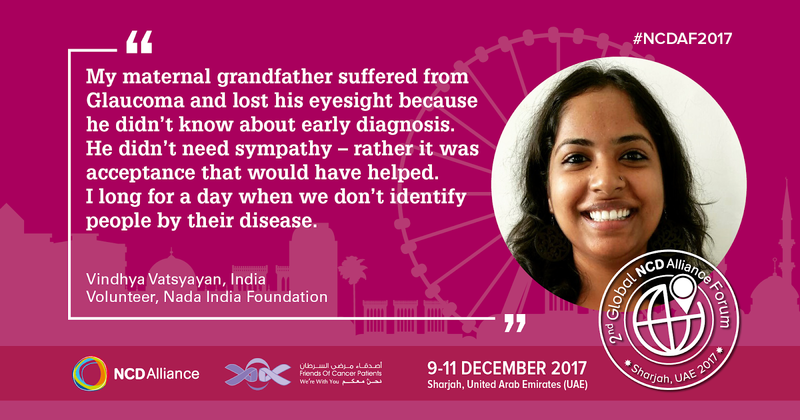 For the first time in my life, I was sharing my grandfather's story of being isolated because of a disease the world knew little about. 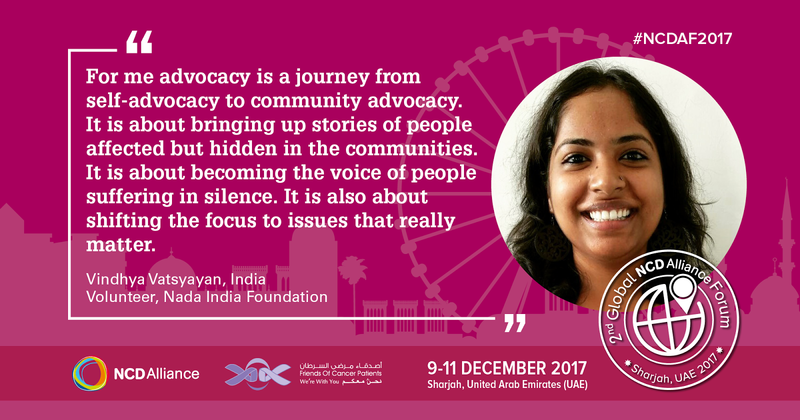 I grew up listening to the stories of people suffering in silence; and therefore, I wanted to bring these voices to the front. I wanted to attend the Forum to learn how to become the voice of the masses. The morning I learnt of my selection for the Forum was one of the best days of my life. I was excited to meet people from around the world and learn from them. I wanted to come back fully equipped to bring change at all levels. The 2-day Youth Pre-Forum Workshop taught me how important it is to have a story, a story that people can relate to. It taught me facts about NCDs, and why facts are so important to understand the intensity of the problem, but that stories of people are what resonate most powerfully. One of my key learnings from the forum was how to engage the right people at the right time. That once you're clear about your mission it is extremely important to map the key stakeholders, set your priorities, and understand the importance and impact of these key priorities. I heard some excellent examples of successful stakeholder engagement and how, in collaboration, we can create an impact at all levels. The forum gave me a new motto: energise, inspire, agitate and communicate. I learned why my voice and those of other young people are so important. We young people cannot simply be spectators while somebody else is making decisions for us. NCDs do not belong to one group or section of society but can affect anyone and everyone. At the Forum, people living with NCDs (PLWNCDs) also participated; they gave me the strength I need to fight back. I met strong leaders who made me realise why it is so important to have complete knowledge about everything related to NCDs. 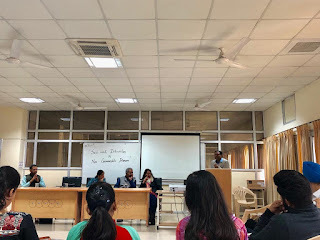 From pitching our idea for change in 60 seconds to learning the cost of NCDs in the coming years, the Forum broadened my horizon in all possible ways. In two days’ time, with tons of brainstorming group activities for setting up three key priorities and the role of youth, we were able to prepare the call to action for youth(link is external). The Youth Workshop’s success could be seen in next three days at the 2nd Global NCD Alliance Forum, where extraordinary people from civil society organisations, WHO, national NCD Alliances, PLWNCDs, NGOs, ministries, government officials and we young people deliberated and set the agenda for advocacy for the upcoming UN High-Level Meeting on NCDs. We were given a platform to raise our voices. We were an integral part of the discussions around advocacy and key priorities for the UN High-Level Meeting. The role of youth was discussed in every session at the Forum. Time and again it was emphasised that our role should not be limited to creating awareness but should also exist at policy level. We might not have the experience, but we have the eagerness to learn and bring in the change for present and future generations. Towards the end of the forum I also made some commitments for my country; to mobilise youth in response to NCDs, to promote the engagement and meaningful involvement of people living with NCDs, and to mobilise and strengthen the civil society in my country. I now have a vision and a mission and am determined to have a time-bound action plan to be heard at the United Nations High-Level Meeting on NCDs later in 2018. I learned from each and every person I met at the forum, but there were a few people and their words that will stay with me forever and inspire me to courageously pursue the changes we want to see. 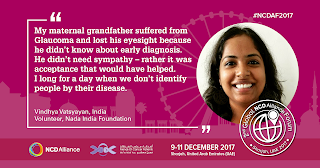 Vindhya Vatsyayan (@NadaPehchaan(link is external)) holds a Master’s degree in bioinformatics, and her work at improving global health began by developing a biological database on ‘hospital acquired infections’. 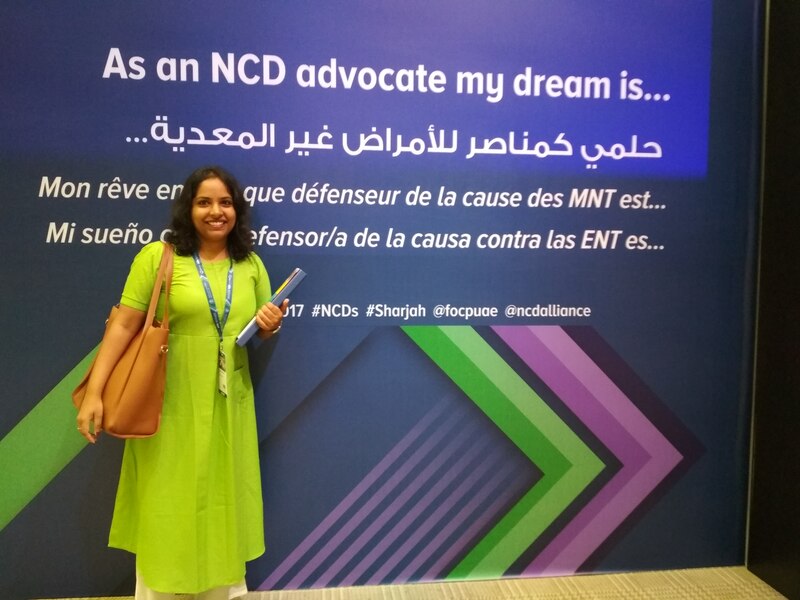 She is now an independent public health consultant in the field of multi drug resistant tuberculosis and a health advocate with Nada India Foundation.